The award winning Jodi Proznick Quartet released their debut CD Foundations (Cellarlive) in 2006 to critical acclaim. The album features a wonderful mix of the tradition, a re-imagining of beautiful pop tunes and strongly crafted original repertoire. From Tilden Webb’s arrangement of Peter Gabriel’s Washing of the Water to the Duke Ellington classic, All Too Soon, this album is sure to delight the listener. Recorded at the Factory Studio, Vancouver B.C. The Jodi Proznick Quartet released their debut CD “Foundations” on Cellar Live on 2006 to critical acclaim. It was nominated for a Juno award and was awarded both Album and Acoustic Group of the Year at the National Jazz Awards in 2007. The repertoire is a mix of original compositions as well as arrangements of songs by Duke Ellington, Oscar Pettiford, Joni Mitchell and Peter Gabriel. 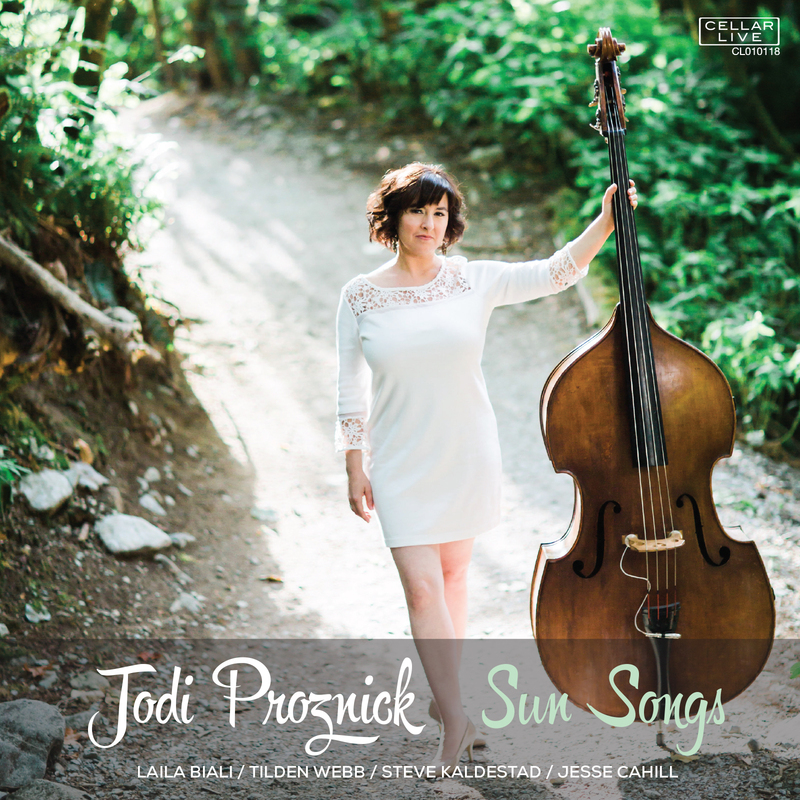 This swinging album features Jodi Proznick on bass, Tilden Webb on piano, Jesse Cahill on drums and Steve Kaldestad on tenor saxophone. Musicians end up playing the instruments they do for all kinds of reasons, but Vancouver bassist Jodi Proznick, the daughter of a nationally acclaimed high school band director, can cite a specific one. “He didn’t know anything about the bass, so as a tenacious 13-year-old I thought that he couldn’t look over my shoulder and tell me what to do,” she said of her desire for musical independence from trumpeter/educator dad Dave Proznick. That’s not to say both parents didn’t inspire their three children’s artistic pursuits. Proznick also studied ballet for 10 years, while sister Kelly is a trombonist/educator and brother Tim plays drums. “I suppose if they were as into hockey as they were into us doing dance and theatre and music I would have been on a hockey team,” said Proznick, 32, who makes her Toronto headlining debut at the Rex tonight. Her first national tour is also a family affair. The band, which played on her first recording, Foundations, includes pianist Tilden Webb, Proznick’s husband of three years, his high school pal, tenor saxist Steve Kaldestad, and her sister’s beau, drummer Jesse Cahill. “In terms of being a leader, it’s kind of ideal in a way, because you’re dealing with people who care about each other,” said the noted bassist. Rooted in traditional swinging post bop, her group covered Duke Ellington, as well as Joni Mitchell and Peter Gabriel on Foundations. “I love pop,” explained the performer, who started out on electric bass and moved to upright at 16, “but jazz was a good fit, because it’s challenging. You’re on the edge of your ability always and it’s such an in-the-moment way to make music. I love communicating with people and playing jazz is this euphoric way of communicating with others: the musicians and the audience. “With `Duke of York,’ for example, I wanted to embody my 28-pound cat, York. Rhythmically, it’s the soundtrack I would put to watching him lumber down my hallway. Proznick’s group began the night affirming a great Canadian composer much loved by many jazz players – Joni Mitchell. Pianist Tilden Webb recast Help Me as a well-crafted waltz, offering a new way to hear Mitchell’s catchy melody. Later in its set, Proznick’s quartet covered another pop-world composer, making Peter Gabriel’s Washing of the Water into an affecting ballad that was half-anthem, half-hymn. Otherwise, the group’s originals and closing cover played to its greatest strength – vivid, unfettered grooving grounded by Proznick’s room-filling bass and driven by drummer Jesse Cahill’s rock-solid beat. Proznick announced one Webb original, Round About, as a “celebration” of the late saxophonist Newman, the Ray Charles sideman who had played and recorded with Webb, Proznick and Cahill. But in fact, every song from the band was celebratory – of jazz’s rhythmic sureness and lyricism, and of the coming together of like minds.